Custom Hand forged Damascus Oxtail Broadsword from the famous Longquan forge of Shen Guan Long. Reserve yours now. Shipping will resume after May, 2012. This is a hand forged 12 layer Damascus high carbon steel creating a “burl wood” grain pattern that is a delight for the eye. The handle and Scabbard are a dark hardwood that is enhanced with the all brass hardware that will wear to a soft antique patina. Everything is understated and elegant. The cutting edge is lightly sharpened making it possible to use this real sword for light practice cuts. It is great as a user or as a display weapon. The balance is within a few inches of the sword guard (most have the balance at least 7 inches from the guard) making it extremely maneuverable in spite of the very solid feel. An absolute delight to use. The shape is like a competition Broadsword having a mushroomed spine to allow easy body contact in use. It also has 2 narrow blood grooves for balance, to lighten the weight and as a design element. 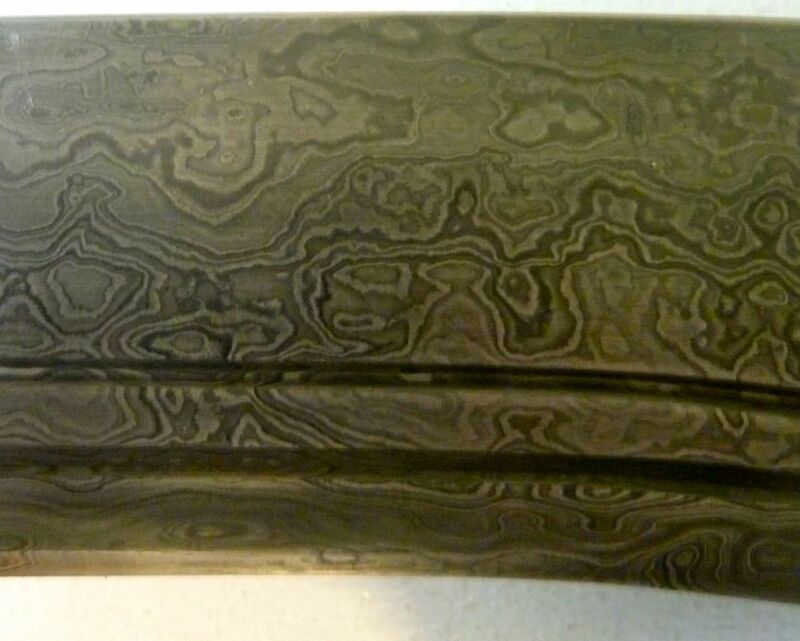 The Damascus pattern is lightly etched to enhance the ability to see the patterns of layers which is unique to each sword. 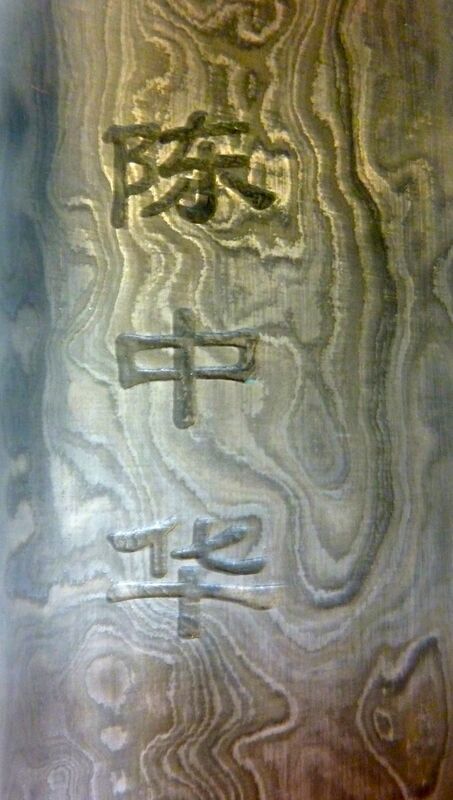 There is a fantastic attention to all detail – a remarkable weapon from a famous forge having the added benefit of having Master Chen Zhonghua’s name engraved on it as well. Only 50 are made in this limited production. The sword is 107 cm (42 inches) long with the blade length of 83cm (32.5 inches) For more information, please contact Allan Belsheim directly. Video of the Longquan (Dragon Well) sword makers. This video is 42 minutes long. Master Sun Zhonghua. Beijing, China. Guy Williamson. Sherwood Park, Alberta, Canada. I highly recommend this broadsword as being a completely usable weapon with great attention to detail. The balance enables maneuvering the sword easily and makes the weight completely manageable. A lot of force can also be generated. 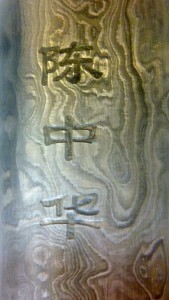 To top it off is the incredible beauty of the Damascus carbon steel (each sword with a unique pattern) and Master Chen Zhonghua’s name engraved on it. This is a custom limited edition of 50 that Master Chen worked with the Master sword smith of Longquan to create. Mine will be prized forever! Will there be a sword coming? 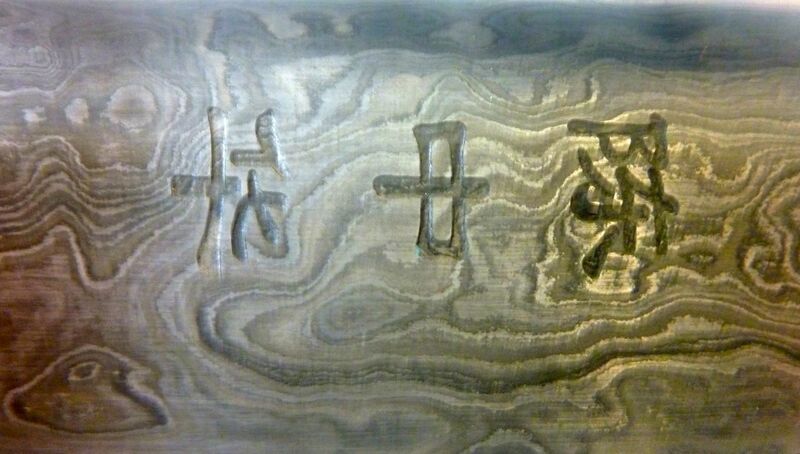 Hello Kelvin, we have a straight sword (not Damascus, but high quality mono carbon steel) with a Hong poem on one side and Master Chen’s name on the other. Another custom work by Master Chen and the Longquan Forge (Shen Guanglong). Yes, I took a look at that one owned by Paddy in Toronto. At the time, Master Chen mentioned that there would be another one coming. I wondered if he was referring to this broadsword, and a different straight sword. The martial arts community share your lost. It is vital that we learn all we can from the Grandmasters that are still alive today, but most importantly continue to teach and share the knowledge they left behind. It is good to know we have Chen Zhonghua; a living branch of a truly great master. Has the Damascus sword resumed shipping? I ordered one. Please let me know when to expect its arrival. The Damascus Broadsword will be available when Master Chen returns to Edmonton June 11 so shipping will not resume before that time. It is worth the wait, as another sword shop is selling a similar stock sword from Longquan for more than three times what we charge for our custom blade. It truly is a beautiful blade. I received mine yesterday. It is beautiful! The patterns and design are very dramatic. The sword seems to say to me “lookout, I am dangerous!” Now, I just need to become worthy of the sword. Thank you for the great sword. Each time I see it or touch, I will be reminded of the tradition and heritage we are part of. Why does the top say $1,000 and the bottom $500? Hello admin where can i find the Straightsword to buy online? 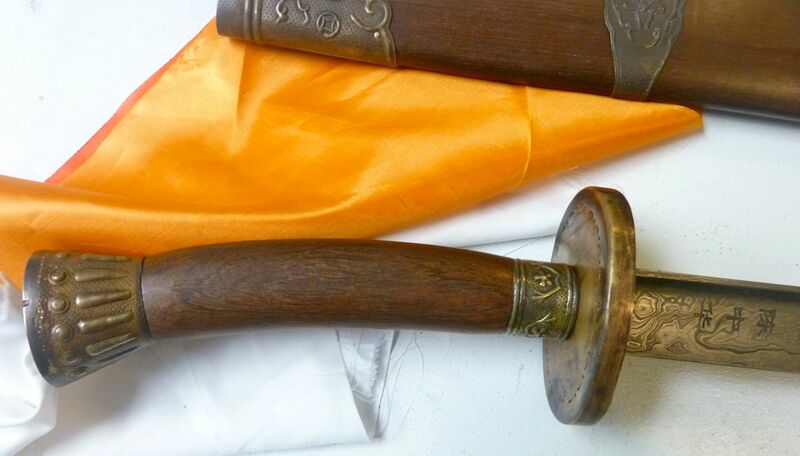 We have several straight swords for sale ranging from $150 high carbon mono steel to custom produced Damascus steel jian designed by Grandmaster Chen Zhonghua. Each of these Damascus swords are custom configured for the purchaser and includes elk horn grip and custom coloured scabbard. 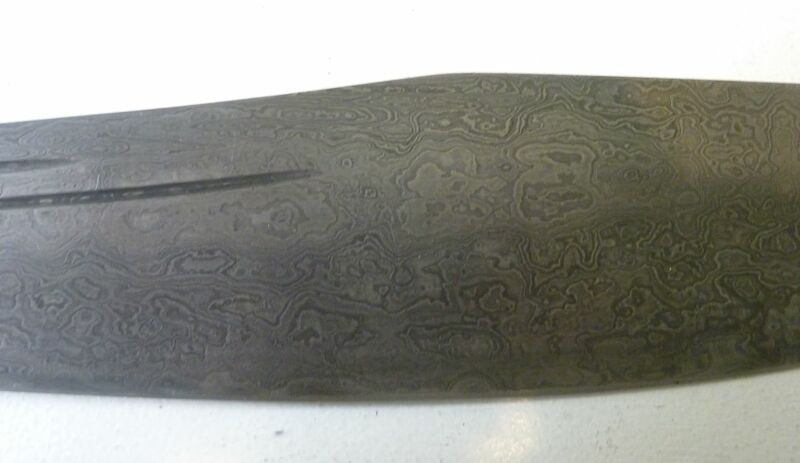 This special Custom Damascus steel Jian sells for $1800 plus shipping. At present, we have limited stock for the Damascus Custom Jian so do not have it advertised online yet. An Elkhorn grip can be custom added to our Damascus Broadsword for $200 extra to the list price. I love this sword. I have a straight sword and now the broadsword in Damascus steel what beautiful weapons. The broad sword is the best I have held, now to see Master Chen again and get some instruction.